In a perfect world, every garden would have that perfect, loamy, well-drained soil, with just the right amount of sunshine, never too cold in winter or too hot and dry in summer……. Meanwhile, back in the real world, gardeners have to face difficult soil, very wet or dry locations, drought and cold, plus often needing fast-growing trees that will quickly give the privacy so often badly needed in home gardens. Fortunately there are plenty of trees that will survive and even thrive in the most unlikely places, making it possible to enjoy the beauty of green, living things around you without having to live in that impossible perfect world. Even generally moderate gardens can have dry spots, where a south-facing corner catches the sun, a roof or building blocks the rain and the soil will be almost constantly dry and parched. When planting in such a spot it is important to add plenty of organic material that will hold water when it is available, especially if the soil is also sandy and fast-draining. Even more important, though, is to choose the right kind of plants that will be able to cope with those kinds of conditions in the long-term. Some evergreen needle trees are very well adapted to drought, with their tough foliage holding on tight to the water inside it. For really hot spots in warmer areas that don’t get too cold in winter, consider the Italian Cypress. If you are in zone 7 or warmer this is the perfect choice for that hot, sunny and dry spot. Planted as a specimen or in a row as a screen, this tree, child of the hot and dry Mediterranean climate, thrives in the dry southern states and in California too. If you live in cooler areas, but still have hot and dry spots to fill, don’t despair, several of the Junipers are ideal choices. We can choose a tree from right here at home and plant the Moonglow Juniper, a native of the Rocky Mountains and hardy all the way to minus 40 degrees (either Fahrenheit or Celsius – at that temperature they are equal!). 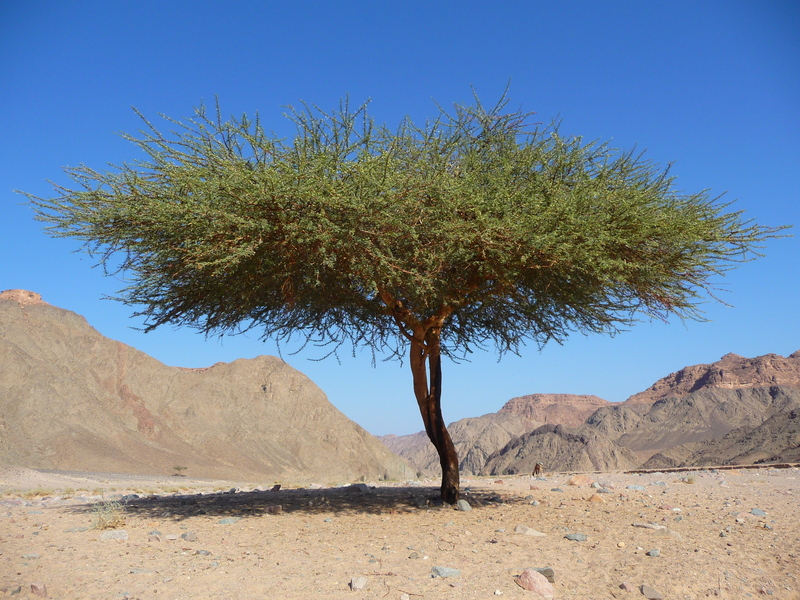 This striking upright tree forms a lovely column of blue-grey foliage 15 feet tall and five or six feet across and will grow in the driest spots you have. Planted in a row it can be clipped into a hedge or left as an informal barrier or screen and although not a fast-growing tree, this means that clipping is an optional extra. Turning to deciduous trees, the Hybrid Poplar tree is not only drought resistant by incredibly fast growing, putting on eight feet a year when young and soon reaching a mature height of 50 feet. In poor soil, drought and exposure to sever weather, this tree will keep on pushing up, looking fresh and green from spring to fall and turning lovely shades of orange-yellow in fall. Top of any list of trees for wet areas, where most other trees will languish and die, are the Willow Trees, especially the Willow Hybrid, which can grow ten feet in a year, but for real grace and a growth-rate just a little slower, the Weeping Willow has to be the top choice. Few trees look more graceful and elegant beside water than this tree, with its slender branches hanging almost to the ground and making a perfect picture reflecting in the water. Even if you don’t have a stream or pond, just poorly drained soil, the Weeping Willow is a great choice, provided you have space and are not close to waste-water lines. For a smaller damp garden, the Corkscrew Willow has beautiful spiraling branches that look as beautiful on the tree as they do cut in a vase, and this tree does not grow as large as the Weeping Willow. Willow trees might be obvious choices, but other trees thrive in damp too. Both the Emerald Green Thuja Arborvitae for cold areas, and the Thuja Green Giant Arborvitae in slighter warmer regions, thrive in damp soil and will grow several feet a year. These are ideal choices for hedges and screen, rapidly filling in and making a clipped hedge or an informal screen well over 20 feet tall if that height is needed. Often overlooked for damp sites, the White Spruce is another tree that thrives in wet conditions – and is cold-hardy as well. If your damp soil is in a shady area too, don’t despair, The Canadian Hemlock will grow well in wet, poorly-drained soil and is happy in full shade. Having just mentioned White Spruce for wet soil, this versatile and tough tree is also the perfect choice for the coldest regions. If you spend your winter at minus 50, White Spruce will keep you company, making a beautiful pyramid-shaped specimen or forming a solid barrier along your property line. Just as hardy, but green rather than blue-gray, the Norway Spruce is another evergreen suitable for the coldest areas of the country. For a cold-hardy flowering tree, the Pagoda Dogwood thrives even across the border in chilly Canada and is one of the most graceful small trees you can find. Its branches spread horizontally, as its name suggests, and in spring the white flowers grace the branches with a special charm. Not quite trees, but large shrubs that can be trained with a trunk or two, the Lilacs should not be forgotten for flowering beauty in the coldest regions. These richly-scented plants thrive in the coolest areas and are hardy to minus 40. Consider the beautiful Bridal Memories Lilac for a commemorative small tree even if your home is in the coldest states. We couldn’t talk about tough trees for tough places without mentioning a Tree Center specialty, the Crape Myrtle trees. With a huge range of colors and sizes, these beauties bring vibrant colors and months of bloom to any garden where heat, sunshine and dryness are the normal conditions. Even planted in a small pocket of soil in full-sun, these trees will grow and bloom continuously from mid-summer to frost, thriving in the hottest states. New varieties have overcome the unsightly white mildew seen in humid states, so now you can have fresh, glossy green foliage even in the Deep South on your Crape Myrtles. If you have old, tired varieties in your southern garden that look gray and dusty for much of the summer, now is the time to take them out and replace them with the stunning new varieties available today. Nature is remarkable, and provides us with the answer to all our problems. So if you are looking for trees for difficult spots in your garden, as a shade tree, privacy screen or attractive flowering specimen, you can be certain that here at the Tree Center we have the solution. Browse our pages or give us a call, we can certainly deliver a tough tree for the toughest place you have.